While Grant Podelco told us there’s not a bike scene in Prague we are undeterred. 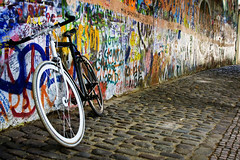 Foreverdigital snapped this shot of a fixie at the John Lennon wall. We’ll bring the bike culture with us and I’m sure we’ll find like-minded cyclists next week. Uploaded by foreverdigital | more from the Bike Hugger Photostream.